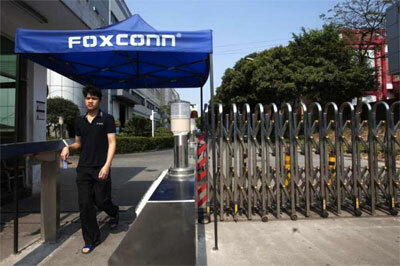 Rediff.com » Business » Will Foxconn re-employ sacked India workers? Will Foxconn re-employ sacked India workers? Foxconn, the information technology and electronics contract manufacturer, has said it would set up new factories in India. Will it, then, re-employ the hundreds laid off when it suspended operations at its unit in Kancheepuram, 60 km from here, in end-2014? The Taiwan-headquartered manufacturer has said it would invest around $5 billion in Maharashtra and create 50,000 jobs. Why, then, the suspension in Tamil Nadu, ask the former workers here. In December 2014, Foxconn suspended operations of its facility, located inside the Nokia Telecom Special Economic Zone, after the fallout at the Nokia facility in Sriperumbudur, near here. The plant had 1,306 workers and mainly catered to Nokia, which suspended operations the previous month, due to the tax dispute that prevented its transfer to Microsoft which had bought the Finnish company’s handset business. Foxconn also runs a unit at Sunguvarchatram, around 45 km from Chennai. The facility employs 150-160 people, including 10-15 contract workers. This is the only currently operational facility, say the workers. Foxconn did not respond to an e-mail sent by this newspaper, related to the current operations in Tamil Nadu and whether it would offer jobs to the ex-workers. Ever since the news broke that Foxconn was coming back to India, former workers are hoping they will get a chance in one of the new factories. “Many of us don’t mind moving and it is a decision for (individual) workers but Foxconn should take some moral responsibility and offer jobs to the workers it employed,” said C V M P Ezhilarasan, union president at Foxconn. Many of the ex-workers are now employed on daily wages in trades such as painting, masonry and marketing, they say. Many say they cannot manage expenses as they’d earlier done. A group of ex-workers are still fighting with the company on job security, saying they’d refused to accept the severance package sent to them. They have approached the state labour department, said an ex-worker. Another employee pulled up the state and central governments. “The Centre is not concerned about Tamil Nadu and the state is not concerned about people employed here. The state should have take up the matter to the Centre and with the Maharashtra government. Whatever happened to us can happen to the people who are going to be employed in the new factories,” he said. They note the company told them the factory has to suspend operations for lack of business, with their main customer become defunct. How, then, the new plans so soon, with $5 billion investment? If there now are orders for manufacture, why not in presently vacant factories here. Ezhilarasan’s answer, rather an allegation, was that the company had enjoyed all the tax benefits and like incentives in the state and when these ended, wanted to move to a new place for the same benefits. The company had a little 1,600 permanent operators on its rolls. It had set up its first unit in 2005 at Irungattukottai in Sriperumbudur. In April 2006, it set up a plant inside the Nokia Telecom SEZ. At the peak of production, it had over 6,000 workers—3,600 contract workers, 1,000-1,500 trainees and 1,700 permanent workers. The Sunguvarchatram factory has three buildings, of which one is producing network-related products. The other two are vacant. A worker said items from one of the buildings was shifted to the new factory Foxconn plans to set up at Tada, Andhra Pradesh.